Good study and organizational skills are the key to success! We have provided a ton of information and resources here to help you be the best student you can be! Some students learn best when listening to information, while others learn best by looking at terms and definitions. You can cater your studying to your learning style! First decide- are you a visual learner (see and look at information), verbal learner (talk about it to remember it! ), auditory learner (listen to absorb the info), or a sensing (physical, hands-on) learner? 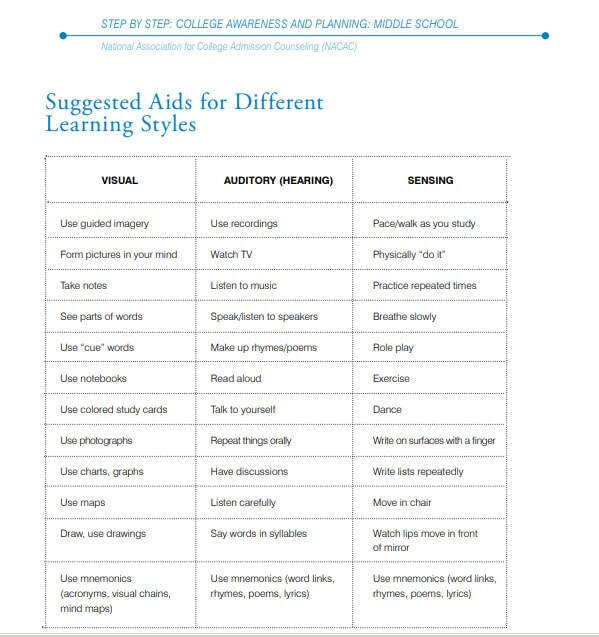 Then pick a column below for suggestions on tools and skills for studying that match your learning style. Having trouble figuring out what you need to do and when? Click on the Weekly Planner button below to print a weekly calendar to plan out projects, study time, and extra curricular activities so you do not miss due dates or get overwhelmed. Have a ton to get done but you cannot keep it all straight in your head? Click on the To Do List button below and print a simple to do list. It helps organize you and it feels great to check things off as you complete them. Having trouble figuring out when to go to your locker and what to pick up? Click the Locker Schedule button below and print out the handy locker schedule. Post one in your agenda book and the other in your locker. Not sure how to condense your notes to study for a test? Study Guides are a great way to prepare for a test, click the Make Your Own Study Guide for Tests button below and print it to make your very own study guide​. ​Many teachers use IXL so that students can practice what they learned during class at home. You can use it to study and prepare for tests as well! Click the link below to go to the IXL website. All teachers offer extra help. Whether you are struggling in a class or just finding the current unit or topic confusing, extra help is a great way to clarify what you do not understand in a class. Many students do not know what to do when they arrive at an extra help session. Here are some tips to help you get the most out of extra help! Going to extra help and saying “I don’t get it” does not work. Make sure you bring specific examples of what you’re finding difficult or confusing. Write down a list of questions you have to bring to extra help. Bring your latest test or quiz and ask the teacher to explain any question(s) that were marked wrong that you are not able to correct on your own. When doing HW, answer all questions and circle any that you found confusing. Ask the teacher to clarify the question/answer. If something is confusing but the class has moved on to the next activity, make a note of what you find confusing or circle it to ask the teacher about it at extra help. If you were absent for a class lesson, utilize extra help for reteaching what you missed or to make up the worksheets that were completed in class. Click on the link below to print this handy Extra Help Checklist so that you can arrive at extra help prepared and ready to learn! The Homework Helpers Club links up 6th, 7th, and 8th grade students with 7th and 8th grade Helpers who can assist with homework or studying. Think of it as working with a study buddy! HOW DOES IT WORK? Homework Help is drop-in, as needed, offered for all major subjects. Go one day a week or multiple days! Helpers will work with students individually or as a group depending on how many students attend that day. Mrs. Hodge, the Program Coordinator, will meet your child on their chosen day to introduce them to a Homework Helper. After School Homework Help uses Edmodo to keep parents and students informed. Sign up and download the app to receive the weekly HW Help schedule and other important announcements! Even if you are not interested in working with a Helper, the HW Helper Edmodo will also feature study skills strategies and information. Click the link or see Mrs. Hodge in the Counseling Department for the code to sign up. Once you join Edmodo, download the app! We also use Remind to keep parents and students in the loop! Sign up for Remind updates and information if you prefer Remind over Edmodo! ​Text @gh667e to the number 81010 or click on the link below.